This is a review of Leading Edge’s Healthy Hair Growth and Gain. The manufacturers of this product claim it can re-grow hair, make nails stronger, and skin healthier. They claim it’s good for use for both males and females with all hair types. To learn more about this product’s ingredients and results and how it might help you keep reading here. The active ingredients in this product are the Amino Acids, Vitamin B7, MSM, Folic Acid, Vitamin B12, Vitamin C, and Vitamin A. The combination of these ingredients ensure hair growth, stop hair loss, and defend hair from split ends and breakage. It’s recommended to take two capsules each day with food. It can take up to six months before results can be seen. 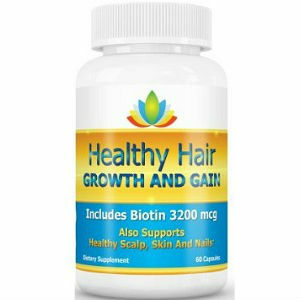 It’s also recommended to continue taking two capsules a day to maintain healthy hair. The website listed no side effects and after research, there were no reports of any adverse side effects from this product. If you are allergic to any of the ingredients in this product you should not take it. Signs of allergic reactions are; trouble breathing, dizziness, and vomiting, if you experience any of these while taking this product discontinue use and see your physician. $29.47 is what you will pay for Healthy Hair Growth and Gain. The bottle contains sixty capsules, making it a one month supply. This product is sold only through Amazon. There is no guarantee but there is a return policy, you can return the unused portion for a refund, minus the shipping and handling. The ingredients in this product are high quality, according to the manufacturers. The active ingredients; vitamins B7, B12, C and A, folic acid, amino acids, and MSM have been known to promote hair growth and stop hair loss as well as adding shine and fullness to the hair. This product also helps improve skin and nails as well as overall health. After researching consumer feedback for this product, it was found to have many more positive reviews than negative ones. Most positive reviews claimed to see results in the area of four to six months, and were happy with the results, even though they were not fast. The negative reviews were a mixture of complaints about the smell and taste of the product and complaints that called it ineffective. The manufacturer does not claim the consumer will see results with the first bottle of Healthy Hair Growth and Gain, meaning you will need to continue purchasing this product to see if it works for you. This is not a vegetarian-friendly product for hair re-growth as the ingredients are encapsulated in a gelatin capsule. John Brownstone	reviewed Leading Edge Healthy Hair Growth and Gain	on August 3rd	 and gave it a rating of 3.